Well, the vacation is truly over. We're back home and trying to catch up to real life. Lots of stress around here from work, but in the midst of the stressful moments, we remember the joy we are going to feel in March! 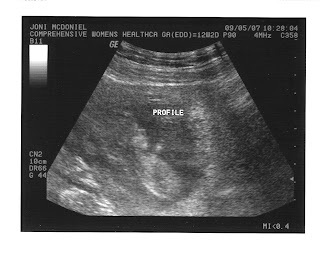 We got to hear the baby's heart beat again on Wednesday, and the next sonogram should be at the end of the month or beginning of November. We are very excited to find out whether it will be a boy or a girl! No preference...excited either way. 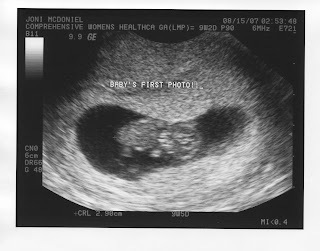 Ok, so I've heard people talk about it...seen pictures...but nothing could prepare me for seeing our baby for the first time. 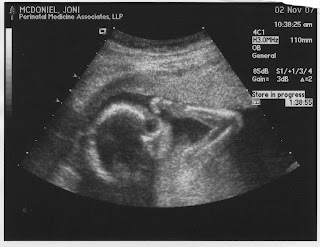 At 9 weeks pregnant, both Joni and I had assumed that we really wouldn't be able to see anything on this first sonogram. Wow, were we wrong! I've posted some pictures, but they really don't show the level of detail that you can see on the screen. It is purely amazing. I can even describe my emotions at the time. I knew we were pregnant, but to actually see the baby...and to hear the heartbeat. The heartbeat...wow...another amazing technology of modern medicine. I think it hit me...that's a LIFE in there. I was speechless throughout the whole process, and feel so fortunate that we live in an age that allows us to see the gift of life in such an early stage. 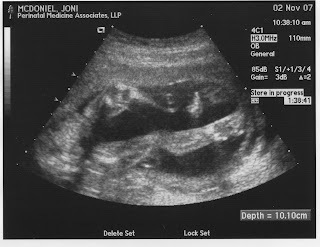 Joni's next sonogram is in a few weeks, and I'm sure I'll be blown away, again. She is feeling okay, but very tired. We are both still on cloud 9, and can't wait to see our baby, again. Sorry it has been awhile since the last entry. We have been very busy, and tired from the crazy pace of life for the past few weeks. I know, I know...it will only get busier with kids. Yikes! We were able to get away a couple of weeks ago for a short vacation. 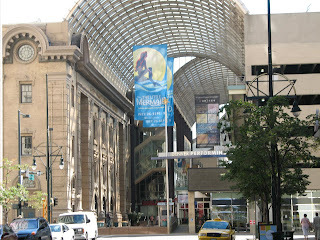 We chose to go to Denver to see Disney's The Little Mermaid the Musical. It was incredible, and we got to see the Broadway cast during the "preview" run. Tons of fun. Well, back to life...Joni's first appointment is next Wednesday, so I'm sure we'll have more to report then. We received the welcome packet in the mail today. It has a ton of information, and our heads are spinning. Fortunately, we live very close to the Texas branch office of our agency, and so our coordinator is going to come over on Tuesday and go over all of the materials with us. We'll get started after that meeting with all of the paperwork gathering. We're so excited! Well, I mentioned earlier today that we had not heard much...until now! We just got an email saying that our application for adoption has been approved by our agency. We are so excited and will keep you up to date on our progress! Thanks for the continued prayers! That's great news for us! We haven't heard too much since the last post. Our application is being reviewed and we should hear back any day now regarding our approval. Welcome to the McDoniel Family Blog. My name is Chet McDoniel, and my wife, Joni, and I started this blog to share with family, friends, and anyone else who cares about our international adoption. Joni and I have been talking and praying for several months, and we have decided to adopt a baby from Vietnam. The agency we have chosen is Children's Hope International, and they have already checked to make sure that my handicap won't pose a problem for us. For those who don't know, I am limb deficient in that I do not have arms, and have shortened legs. I use an electric wheelchair to get around long distances, and type, drive a van, etc with my feet. Our agency was very efficient in letting us know that this would not be an issue at all for adopting from Vietnam. So, our application was mailed on Wednesday, and we are now waiting to hear that they received it. Stay tuned to this blog for more updates, and we welcome you on our journey.